King Pacal, Maya King Pacal, Maya Art, Maya, pre-columbian reproductions. King Pacal (also known as Pacal the Great) was born in the year 603 A.D. He was king of the Maya Kingdom of Palenque and is said to have reigned for 67 years until his death at the age of 80. The name "Pacal" means "shield" in the Maya language. Pacal expanded Palenque's power in the western part of the Maya states, and initiated a building program at his capital that produced some of the finest art and architecture of the Maya civilization. 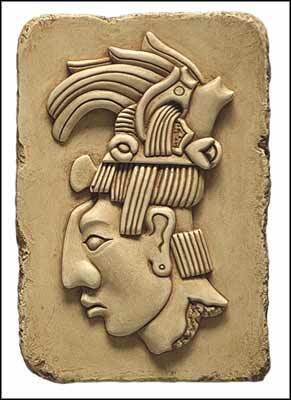 He was preceded as ruler of Palenque by his mother Lady Zac-Kuk. As the Palenque dynasty seems to have had Queens only when there was no eligible male heir, Zac-Kuk transfered rulership to her son upon his official maturity. He accended the throne at age 12 on 29 July, 615 A.D. After his death, Pacal the Great was worshiped as a god, and said to communicate with his descendants. His elaborate temple tomb had a stairway down to his crypt, and after this was sealed up it had a long "speaking tube" connected to the temple atop the step-pyramid. The lid of Pacal's tomb, referred to by some as The lid of Palenque, is the most photographed, reproduced and written about stone work of its kind.